We speak words literally grounded in the stuff of this world and always returning to the stuff of this world. 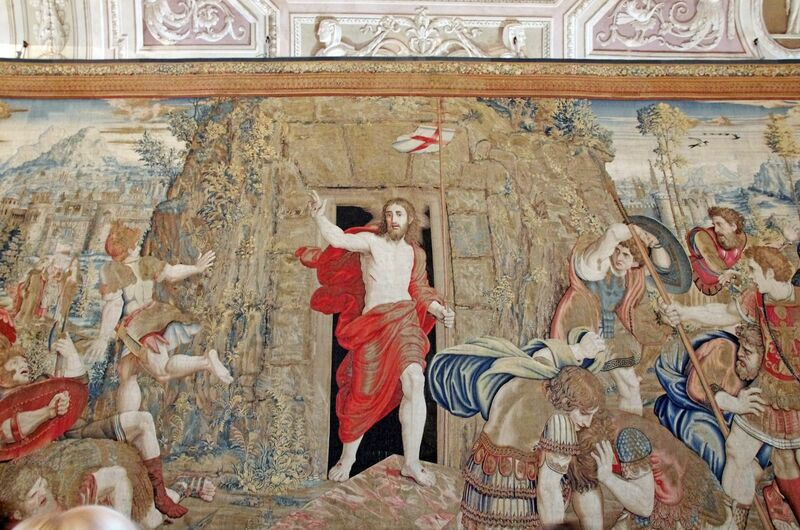 In his Seven Stanzas at Easter, John Updike reminds the church that we are grounded on the physical resurrection of Jesus Christ and that all our prayers and hopes return to the very root of this physicality. Today in our Gospel reading, we sit with the disciples as they are puzzling over stories they have heard about appearances of the risen Jesus. They are in the middle of a story and trying to interpret that story at the same time. They are struggling to understand because the resurrection is not simply an event among events, it is the event that will change everything and will require a change of thought, heart, and action. Their whole world will be reformed in light of the Christ. Even as they are talking, Jesus stands in their midst and says, “Peace be still!” Just as Jesus calmed the troubled sea, he calms the troubled heart. He calms their fears. They will not be able to think their way into grasping this moment, but rather they must face him, encounter him. He says, Why are you troubled, and why do doubts arise in your hearts? 39 See my hands and my feet, that it is I myself. Touch me, and see. For a spirit does not have flesh and bones as you see that I have.” (Lk 24:38–39). Rather than trying to grasp, they must move out toward the reality of who he is, physically risen and standing in their midst. He eats a piece of fish. Christ who was dead and is now alive. When the Son of God humbled himself and became a man, this was not a temporary moment in time. God enters into our history in Jesus Christ and after the resurrection, he rises in this story. He has bound himself with humanity and humanity is bound with God. The creation story is not discarded in this story of human redemption, but rather creation is taken up afresh. John will later write, “In the beginning was the Word, and the Word was with God, and the Word was God. He was in the beginning with God. All things were made through him, and without him was not any thing made that was made.” (Jn 1:1–3). When the Sonrises from the dead, creation is taken up afresh. Chesterton will say, that on the first day of resurrection, the Son walks forth into a new heavens and new earth.[ii]Literally. Because the heavens and earth have been transformed in the physical resurrection of the Son. He is participating in the very order of the word that he has created. Even today these words about the resurrection are bigger than we can fully imagine and grasp. This meditation upon the life, death, resurrection and ascension of Jesus Christ is so rich and vital and overwhelming, we can study and pray and seek to know our whole lives and still just catch a glimmer. As we follow our story this morning, we see that as soon as Jesus establishes His physical presence in their midst, He begins to teach them the Scriptures. He helps to open their eyes to that all of Scripture has testified of Him, of His coming, of His life and death and resurrection, and of the forgiveness of sins. This is the Gospel, the Good News “that the Christ should suffer and on the third day rise from the dead, and that repentance for the forgiveness of sins should be proclaimed in his name to all nations, beginning from Jerusalem. (Lk 24:46–47). Creation has been restored in Christ and it is very good news indeed. The disciples are made into witnesses of this Good News. They will be clothed with power from on high to teach this Good News. They will eventually go out into all the world and proclaim this Good News. This news is so good that we can barely receive it. Our ears can barely hear it. Our eyes can barely see it. Throughout history some Christians cannot fully wrap around this good news and moves on to other good news. Some other great event. Sometimes the focus becomes on gathering more knowledge. Knowledge becomes the center of what the faith means, and some folks look down on everybody that doesn’t have their specialized knowledge of the Gospel. Then we have another group over here who focus on some kind of emotional experience with this good news. And suddenly, their personal experiences have made them set apart or somehow better than everyone else that doesn’t have the same types of experiences. Even in the liturgical churches, the form itself can become more important than the good news. The need to do everything a certain way trumps the good news. And then again, throughout history, there’s been many Christians who have focused on what we’re doing. The social action is a result of this good news, but once again that can trump the actual good news. Now all those things are important. Knowing, doing, the evangelical encounter with Christ, the worship of God’s people. All these are important. But all these are subservient to the very basic good news that we’ve heard today in the reading and the words of Christ as he teaches his disciples. All of Scripture has been witnessing this moment. He lays out a way of reading Scripture that will effect the way the Apostles read the Bible. They will begin to search through the Old Testament and try to hear these stories. John, the Gospel writers, Paul and others write about how the Scriptures testify to the redemptive hope found only in the Christ. By the Spirit, they become witnesses of the life, death, resurrection, andascensionof Jesus the Christ. They continue to ask, “What does this mean?” By His Spirit, He is leading the into all truth. As we read Paul’s letter, we see how he’s continually challenging the churches that are moving beyond the simplicity of this good news. If we survey the letters of Paul, we find people are easily distracted by spiritual experiences, racial distinctions, ancient Jewish rituals, secret knowledge, and the unusual. Again and again, Paul points them to back to the this-ness of the Gospel. 3 Grace to you and peace from God our Father and the Lord Jesus Christ, 4 who gave himself for our sins to deliver us from the present evil age, according to the will of our God and Father, 5 to whom be the glory forever and ever. Amen. Ga 1:3–5. 6 I am astonished that you are so quickly deserting him who called you in the grace of Christ and are turning to a different gospel— 7 not that there is another one, but there are some who trouble you and want to distort the gospel of Christ. (Ga 1:6–7). In the reading from first letter of John we heard this morning, John is a witness of the Risen Lord, and he will emphasize the good news of forgiveness in Jesus Christ and restored communion with God. Later in the letter, he will also talk about those who have gone about from among them to cause division. These people are adding to this good news. Because the good news is simply not enough. The Good News in Jesus is enough. It’s just simply they failed to behold what is happening in this good news. As Hans Urs Von Balthasar once wrote, “[W]e think that God’s Word as been heard on earth for so long that by now it is almost used up, that it is about time for some new word, as if we had the right to demand one. We fail to see that it is we ourselves who are used up and alienated, whereas the Words resounds with the same vitality and freshness as ever; it is as near to us as it always was.”[iv]He continues, “It is impossible to listen to any individual Word of God without hearing the Son who is the Word. Moreover, it is futile to leaf through the writings of the Old and New Covenants in the hope of coming across truths of one kind or another, unless we are prepared to be exposed to a direct encounter with Him, with this personal, utterly free Word which makes sovereign claim upon us” (18-19). We are called afresh to sit with the message of the Good News, to hear it, to soak in it. We are called to sit at the feet of Jesus with the disciples as He opened their minds to understand the Scriptures. What we see, both in the New Testament, but across the church age, that as the church really sits with this news, they begin to see how all of scripture testifies to this, but also how all of creation is testifying. We can’t see it outside of the revelation of Christ but all of creation is testifying. And not only that, all of history is summed up in this good news. So there is much that begins to open up as we pause over this. And as the church is paused over this, through time, we already see it in the letters and scripture, as Paul is writing and responding to the various challenges. He’s quoting hymns that the church is using in worship on Sundays. Refection on the good news is a reflection that is an outgrowth of the gathered community: praying together, fellowshipping together, and doing essentially what they did we saw in the story today. They’re sitting, listening, talking, hearing the good news and the spirit of God is instructing them. The instruction and the study and the meditation of the risen Christ happens in the community of God. And it has happened from age to age. As I meditated upon the passage this week. For whatever reason I was drawn to Irenaeus. He lives about 140 years after this event, the late 100s, and he is sent on a mission by the church in Lyon to Rome, and while he’s away there’s a horrible persecution. The Bishop of Lyon is killed and many of the Christians are killed in horrific ways that are not worthy to recount. When he returns, they make him the bishop. Irenaeus must face these various people in the region who are adding to this good news. We speak of them as gnostics. It’s really difficult to summarize what they believe because even Irenaeus shows us they all believe different things. Basically, the gnostics have these various teachers that supposedly have some kind of secret knowledge that’s not handed down in the public tradition. They gather a group a disciples for themselves and they interpret it for their disciples. Suddenly, what they begin to do is lead people away from the simplicity of the Gospel. Irenaeus is forced to combat these teachers. And one of the things that seems to be common about the gnostic teachers is that the creation itself is not necessarily good. They tend to devalue creation and even the idea of a physical resurrection would be unimportant. They keep moving toward the spiritual. The spiritual truth that they’ve been given. How does Irenaeus combat them? He combats them with wisdom directly from the public worship of the community. He says, we preach a public gospel that’s been preached publicly, always. He turns both to scripture, and to the teaching of the fathers that have gone before him. He says this good news is what the church has been testifying since the Apostles and that’s what we teach. So Irenaeus shows us a model that we see repeated from age to age. When the church is at its very best the word tradition is about preserving the good news that’s been handed down. It is not about preserving specific rituals. The church has always tried to stand in guard to protect against anything that leads away from the good news. We can follow this right into the Reformation. That’s exactly what the Reformers feel like they’re doing. Not leaving the tradition of the church, but restoring those things that have moved away from the simplicity of the gospel news. So again and again, we, ourselves, in a culture that constantly wants the latest, the newest, a return to the simplicity of the Gospel. Instead, we prayer, Lord open my eyes, afresh. That I might behold the beauty of Christ and the mystery of his resurrection. 20 Now to him who is able to do far more abundantly than all that we ask or think, according to the power at work within us, 21 to him be glory in the church and in Christ Jesus throughout all generations, forever and ever. Amen. (Eph 3:14–21). [i]Telephone Poles and Other Poems© 1961 by John Updike. Reprinted by permission of Alfred A. Knopf, a division of Random House Inc.
[ii]See Everlasting Man. “On the third day the friends of Christ coming at daybreak to the place found the grave empty and the stone rolled away. In varying ways they realized the new wonder; but even they hardly realized that the world had died in the night. What they were looking at was the first day of a new creation, with a new heaven and a new earth; and in a semblance of the gardener God walked again in the garden, in the cool not of the evening but the dawn.” Chesterton, G. K.. The Everlasting Man (p. 136). Wilder Pulications. Kindle Edition. [iv]Balthasar, Hans Urs von. Prayer (p. 16). Ignatius Press. Kindle Edition. [v]“This then is the order of the rule of our faith, and the foundation of the building, and the stability of our conversation: God, the Father, not made, not material, invisible; one God, the creator of all things: this is the first point of our faith. The second point is: The Word of God, Son of God, Christ Jesus our Lord, who was manifested to the prophets according to the form of their prophesying and according to the method of the dispensation of the Father:2through whom all things were made; who also at the end of the times, to complete and gather up all things, was made man among men, visible and tangible,4in order to abolish death and show forth life and produce a community of union between God and man. And the third point is: The Holy Spirit, through whom the prophets prophesied, and the fathers learned the things of God, and the righteous were led forth into the way of righteousness; and who in the end of the times was poured out in a new way6upon mankind in all the earth, renewing man unto God.St. Irenæus, The Demonstration of the Apostolic Preaching, ed. W. J. Sparrow Simpson and W. K. Lowther Clarke, trans. J. Armitage Robinson, Translations of Christian Literature. Series IV, Oriental Texts (London; New York: Society for Promoting Christian Knowledge; The Macmillan Co., 1920), 74–75. [vi]For more information see Rowan A. Greer. Broken Lights and Mended Lives: Theology and Common Life in the Early Christian Church. Pennsylvania State University Press, 1991.